Making DIY wood signs has become my thing! I love the way they look, along with how easy it is to customize them. 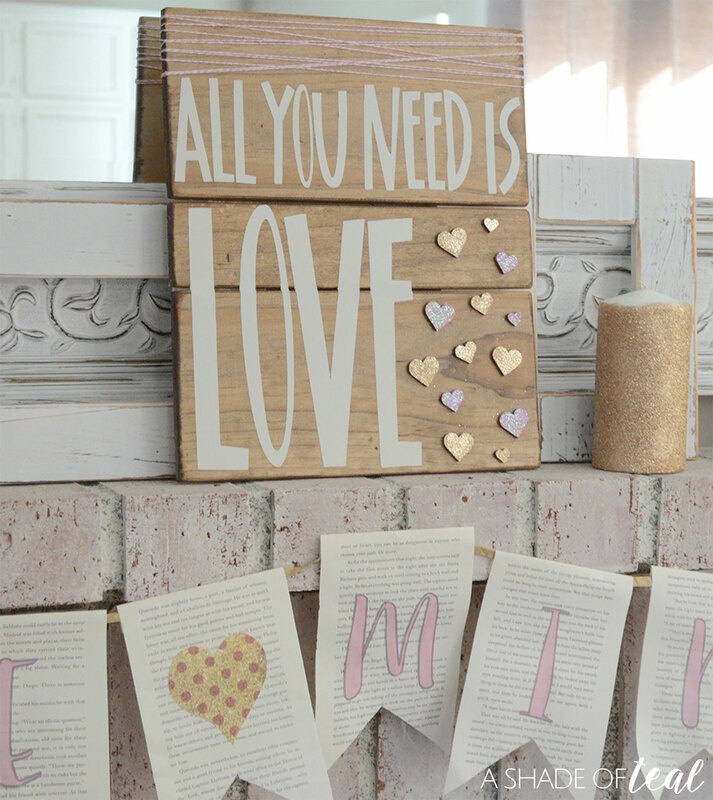 My most recent project is this Valentine’s Day sign that reads “All you need is Love”. I decided to create the Valentine’s Day sign my for daughters. At my house we love celebrating Valentines day as a family since it’s a great way to share how much we love each other. Every year we exchange our favorite card from American Greetings cards along with something little. This year, my daughter’s will get this new DIY sign. The sign was really easy to make. 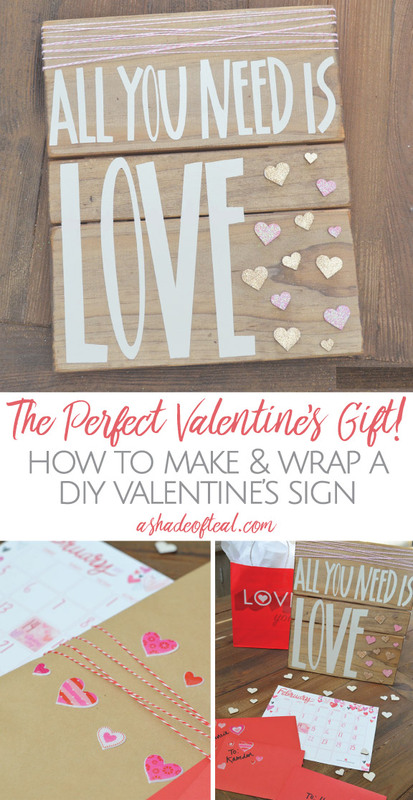 Here’s a quick breakdown on how to make the DIY Valentine’s Day sign for yourself! Wood, I used scrap wood since I have so much. My pieces were 3/8″ thick and (2) 11 1/2″ x 5 1/2″ pieces and (1) 11 1/2 x 2 1/2″ piece. Step 1: Cut, sand, and stain the wood. Step 2: Arrange the finished pieces of wood. Step 3: Add the back support pieces with either a hammer & nails, or a nail gun. This is how the sign will stay together. Step 4: Add part of your vinyl letters, in my case “LOVE”. Step 5: Add the rest of the vinyl letters. Step 6: Add an extra embellishment. I used these small wood hearts. Step 7: Paint and add glitter to the hearts. 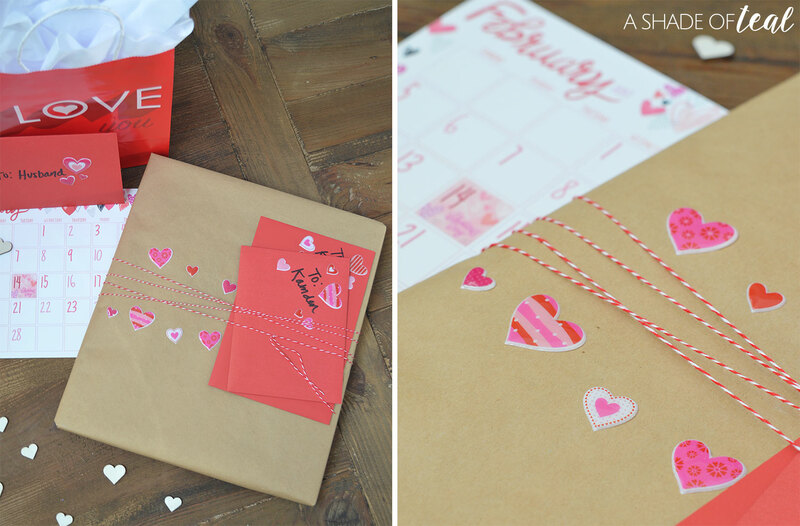 Step 8: Add the finished hearts with glue and wrap some twine around the top for the finishing touch. Here’s my sign all complete and ready to be displayed. As you can see it eventually will be displayed on my mantle with the rest of my Valentine’s Day Decor. But before it permanently makes it home here, I need to wrap it up for my daughters. I love gift wrapping presents, especially for my daughters! My youngest is only 7 months so she obviously doesn’t care yet, but my 3 year old love’s opening gifts. So making this present extra special for her is a must! 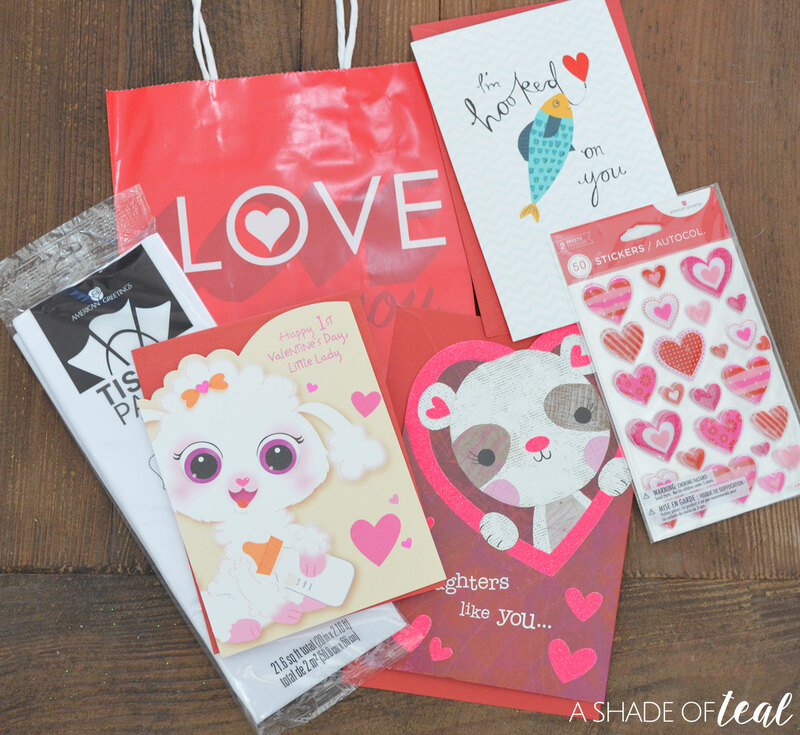 To start the wrapping I found the perfect Valentine’s card from American Greetings cards along with some cute stickers and gift bags. 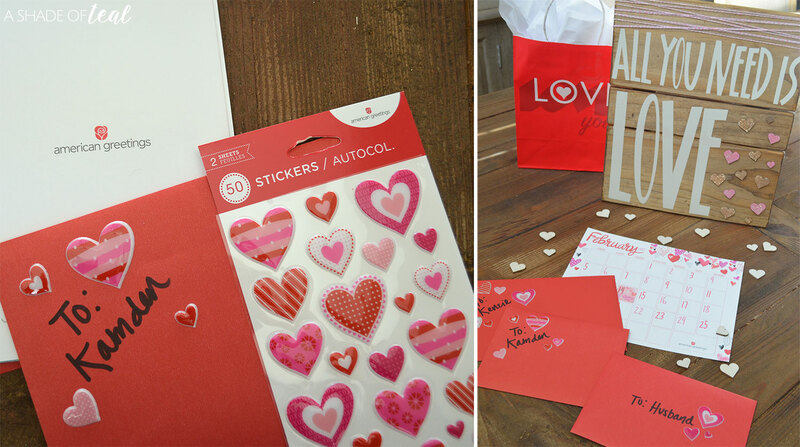 Find all your American Greetings products for this Valentine’s day here. I added the heart stickers to the cards to give it that extra pizzazz! Both my girls will get a card, but I was so excited to find a 1st Valentines Day card for my youngest! I love celebrating first’s! I also couldn’t help but get a little special something for my husband (hint, hint it’s in the red bag! ), along with a Valentine’s card as well. You’ll notice I labeled his card with “husband”. For some reason when we finally got married, 6 years ago, we were pretty excited to call one another husband and wife. I think this was extra special for us since we dated for 9 years before we tied the knot! Since then, we’ve kept with the tradition of calling each other “husband” and “wife”! To finish wrapping the wood sign I used some Kraft paper. Then I decorated with some wrapped twine and of course more American Greetings cards heart stickers. My 3 year old is obsessed with stickers, so she’ll love the package. I’m so excited for them to open the sign and their special cards this Valentine’s Day! More importantly, I’m excited to just spend the day with them letting them know how much I love them. Don’t forget Valentine’s Day is on a Tuesday this year. 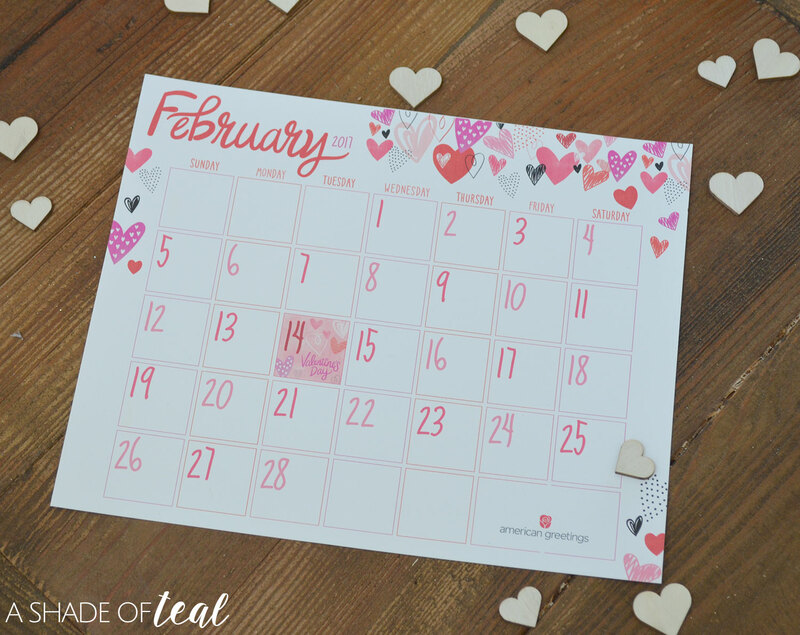 If you need a reminder, you can download and print this cute February 2017 calendar from American Greetings blog. They also have a bunch of cute printables; including a shopping list with tear-off “loves notes”, a 8×10 Valentine’s Day frame-worthy quote, and even a mobile or desktop wallpaper (to keep Valentine’s Day top-of-mind)! Find all of them here on American Greetings blog. So I hope you make this Valentines day special for someone you love. When it comes time to writing that meaningful message, you might want to check out this list of What to write in a Valentines Day card. Happy Valentine’s Day! I am obsessed with the sign! Love it! Thanks Tammy, the banner is also my favorite part! This wood banner is so cute. I would leave it up year round. How ADORABLE! You are so good at coming up with crafty ideas! I think I just may have enough of the supplies to make something like it. Thank you for the inspiration! Too cute! I need to do this. It would make a fantastic gift. I love your sign it is gorgeous. I to have a Cricut and I have so much fun with it. I love to make glasses with different sayings and mugs. I am going to try your design. I know I love using the Cricut, so many great things to make! Your signage was so simple but it rocks. Its very plain design makes it more recognizable because you highlighted the powerful message. Good work! Perfect gift for valentines! I really like personalized items than store bought. I agree, they have so much more meaning. Cute designs. it looks easy to make but I know it takes musch effort and love on it. Thanks Karlyn! It wasn’t to bad! So cute and unique! 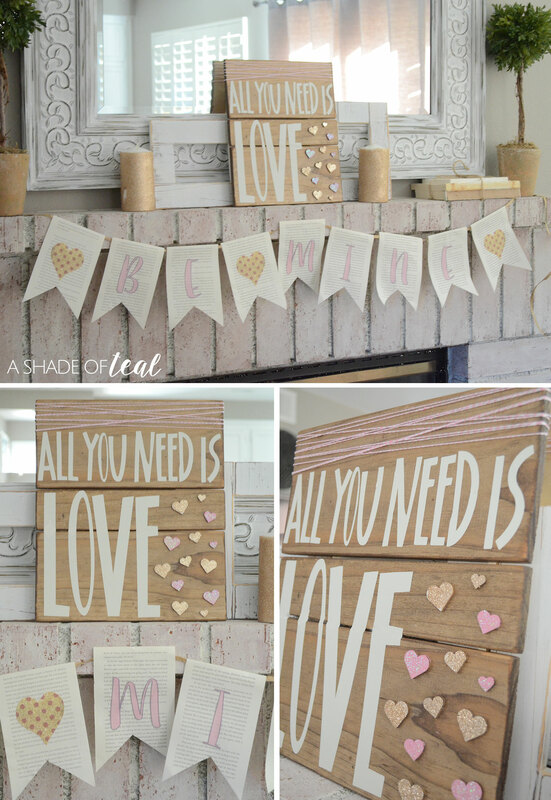 There are so many ideas I’ve seen about decorating for Valentines and other DIY projects. All are lovely, including yours. My husband and I do not usually decorate for Valentine’s day. We just spend the day together, gadget free. Looking forward to a movie marathon with him! How fun, I would love to have a quiet movie day. This turned out really cute! thanks for the fun idea. I will have to make one for my house. Your mantle is just gorgeous. I can’t wait to try making my own sign and I hope it looks as cute as yours. Thanks Terri! I’m sure yours will turn out great as well! This is so flipping cute! I wonder if my boys and I can pull it off this weekend! So romantic! I just loved those heart stickers, all of them! Thanks for sharing such creative ideas with us.